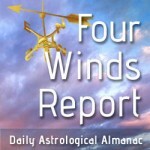 Today’s first quarter Moon marks one week since the Aquarius New Moon and eclipse. (Does it feel like it’s been longer?) What projects are you starting to build some momentum with? Do they relate at all to any intentions you set last week? With the Moon in Gemini, notice whether you feel like you have to operate on two (or more) tracks at once. Today’s Birthdays: Jean-Baptiste Morin (1583-1656), Samuel Pepys (1633-1703), George Frideric Handel (1685-1759), Franz von Stuck (1863-1928), W. E. B. DuBois (1868-1963), Maude Royden (1876-1956), Karl Jaspers (1883-1969), Victor Fleming (1889-1949), Majel Barrett (1932-2008), Peter Fonda (1940), Johnny Winter (1944-2014), Allan Boesak (1945), Rebecca Goldstein (1950), Sallie Baliunas (1953), Niecy Nash (1970), Emily Blunt (1983), Tye White (1984), Dakota Fanning (1994). Something extraordinary is happening. Yesterday, survivors and families from last week’s Parkland, Florida, school shooting attended an epic ‘listening session’ with Pres. Trump, who for once behaved like a human being and actually sat there paying attention. 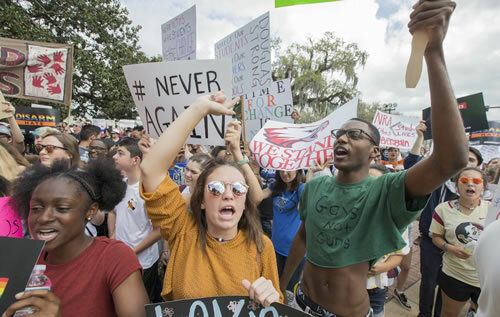 Therese Gachnauer, center, an 18-year-old senior from Chiles High School and Kwane Gatlin, right, a 19-year-old senior from Lincoln High School, both in Tallahassee, join fellow students protesting gun violence on the steps of the old Florida Capitol in Tallahassee, FL., on Feb. 21, 2018. Students at schools across Broward and Miami-Dade counties in South Florida planned short walkouts Wednesday, one week after the deadly shooting at Marjory Stoneman Douglas HS. Photo by Mark Wallheiser. On the same day, other survivors from Marjory Stoneman Douglas High School confronted Sen. Marco Rubio at their state capitol in Tallahassee, and it was a real showdown. Thousands of students across the country staged a walkout from their schools to demand stricter gun laws. There are two direct actions planned for March, including a nationwide walkout at 10 am local time on March 14, and the Million Kid March on DC for Gun Control on March 24. The kids are showing the way. They’re being the adults, and the rest of us need to listen, follow and do everything we can to support and encourage them. The Parkland shooting took place the day before a solar eclipse, and any event around an eclipse can be a turning point. This eclipse, though, had a special quality: it was conjunct the Moon in the United States natal chart, which is conjunct the asteroid Pallas Athene. The U.S. has politics scripted into its personality. But typically it’s naive, and has a love for hucksters, con men, phonies, preachers, and the good old days. Suddenly, there seems to be an awakening, which is led by young people — the ones who have the most to lose, the most energy and the strongest ideals. It’s been fantastic to see students taking action, and planning to take more action. It’s been beautiful to see young people stand up in support of claiming their own destiny. Moon Phase: Moon is in Waxing Crescent phase and enters First Quarter phase at 12:09 am PST / 3:09 am EST (08:09:04 UTC). Moon Sign: Moon is in Gemini and enters Cancer on Feb. 24 at 7:06 pm PST / 10:06 pm EST (03:05:55 Feb.25 UTC). Juno enters Pisces at 12:11 pm PST / 3:11 pm EST (20:10:45 UTC). Asbolus stations direct at 7:48 pm PST / 10:48 pm EST (03:48:02 Feb. 24 UTC). — Sun sextile Pelion at 4:54 am PST / 7:54 am EST (12:54:26 UTC). — Sun sextile 1992 QB1 at 5:50 am PST / 8:50 am EST (13:49:38 UTC). — Mercury sextile Hylonome at 9:54 am PST / 12:54 pm EST (17:53:47 UTC). — Mars sextile Okyrhoe at 10:15 am PST / 1:15 pm EST (18:15:17 UTC). — Mercury square Altjira at 3:59 pm PST / 6:59 pm EST (23:58:33 UTC). Confront the many ways you’re different from others, and therefore, will never meet their expectations. Yet once you accept who you are, and the many ways you view life differently from the people around you, you’ll be on the path to finding your true happiness. Accept that you take an original view of relationships, and never pretend to be someone else. In astrology, the 12th house is the one that is usually said to correspond with yours, the 12th sign. This is the most mysterious house, which is about all things invisible, and not available to the normal senses. How have your dreams been? You are made up of all of who you are. To be yourself, you must be completely you, and draw on all of your experiences and all of your feelings, and count every need and desire as valid. Be aware of when you try to cast away or disown certain elements of your being. Today’s first quarter Moon marks one week since the Aquarius New Moon and eclipse. (Does it feel like it’s been longer?) What projects are you starting to build some momentum with? Do they relate at all to any intentions you set last week? With the Moon in Gemini, notice whether you feel like you have to operate on two (or more) tracks at once. Is that comfortable for you, or do you feel a little scattered? Figuring out your most pressing priorities on paper might help in managing it all. Meanwhile, the asteroid Juno enters Pisces today. What does it mean to you to have a ‘spiritual’ bond with a partner? Is that a priority for you? Between now and the end of April, track your emotional needs in your relationships, and notice whether you’re more inclined to imagine expressing them rather than actually express them.